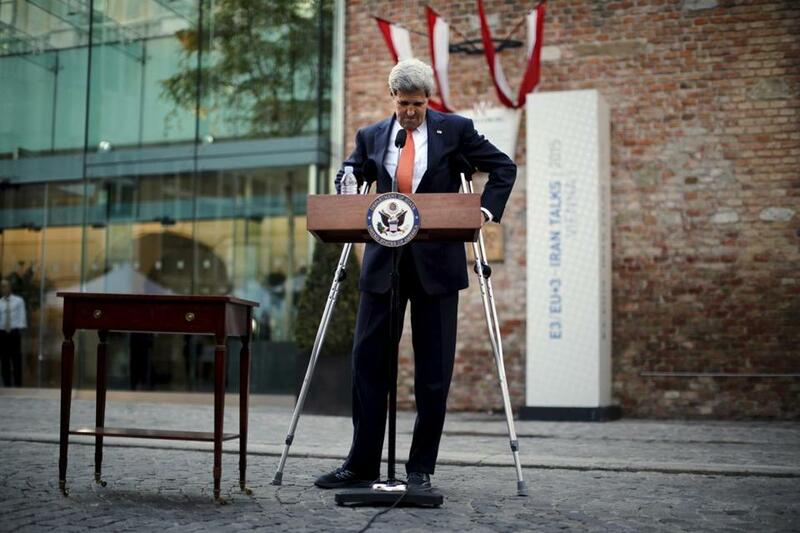 John Kerry got around on crutches during the negotiations in Vienna in 2015. John Kerry hobbled on crutches, perhaps the only thing slowing him down, as he shuttled to and from marathon negotiation sessions in an ornate 19th-century palace in Vienna. It was the summer of 2015. Donald Trump had just announced his candidacy for president, and Kerry, then secretary of state in the Obama administration, was slogging through excruciatingly detailed talks to curb Iran’s nuclear ambitions. The days stretched into weeks, and my editors teased me, only half in jest, about my mounting bills in a luxury hotel in Vienna (the fact that it was called the Grand Hotel didn’t exactly help my cause). As the tedium of waiting for a breakthrough wore on, those involved took to cataloging the talks by the numbers: This was at least the 17th time that Kerry’s team had been in Vienna for negotiations — long enough to celebrate almost everyone’s birthday at least once. One team member calculated they had traveled 400,000 miles, enough to circumnavigate the globe 16 times, over the 18 months of intense negotiations with Iran. The US negotiating team in Vienna chewed through 10 pounds of Twizzlers, 20 pounds of string cheese, and more than 200 Rice Krispies Treats. On Twitter, those mundane facts went viral. For the general public, they were a lot easier to grasp than speculation about the number of Iranian uranium centrifuges that had been disclosed to international inspectors. But the drama over the future of Iran’s nuclear program, a dire threat to Israel and the rest of the Middle East, was real. In the end, neither side got everything it wanted, and both would have problems selling the compromise in their home countries. But with exhausted looks on their faces, both Kerry and Zarif projected a sense that something historic had taken place. If that was the old version of diplomacy, the new version revealed itself Tuesday. President Trump, with a few utterances, unraveled the years of talks that produced the Iran nuclear deal. Trump’s approach to world affairs relies more on gut instinct and improvisation, and a distaste for compromise. Kerry believed in engaging the world, while Trump says he’s tired of the world taking advantage of the United States. Kerry could be long-winded and wonky as he explained the intricacies of the deal, while Trump is blunt and plain-spoken but seems to lack a clear understanding of all of its details. The old style of diplomacy that Kerry relied upon seemed to recognize that, yes, you and I are from different backgrounds, from different countries, and have different interests. But we’ll trust each other enough to come to terms. Trump’s philosophy: America first. His political rise depended on nationalism, nativism, isolationism. He downplays the idea that national interests might actually be linked to something happening half a world away. How do you engage in diplomacy when you can’t make a concession and you have to win? Trump vowed that if elected he would rip up the Iran deal — and on Tuesday he did. It remains to be seen if Trump can create a new nuclear agreement with Iran, or if he can bring North Korea into a separate deal to end its nuclear threat. There is some irony in that while the Iran deal was once deeply unpopular, new polling now shows that two-thirds of Americans want to keep it in place. The story of the Obama White House era was tightly controlled and scripted, each moment choreographed. There wasn’t much suspense, with briefings and arguments carefully laid out. The Iran deal was different. It had fluidity and uncertainty. Hundreds of reporters gathered outside the Palais Coburg hotel to await the next sign of progress or retreat. Before leaving for Vienna, I interviewed Energy Secretary Ernest Moniz, who was an integral part of the negotiating team. He offered some advice. “Pack a lot of underwear,” he said. The talks dragged on so long that the Iranian delegation had to leave the nearby Marriott after their reservations ran out and other guests were ready to check in. American reporters, staying at a hotel nearby, could tell that negotiations were continuing when the State Department extended reservations for another three or four days. We all missed the Fourth of July. My family was gathering in the mountains of North Carolina. Kerry, whose family gathered in Nantucket, apologized profusely that everyone was missing the holiday, and hosted a party at the hotel. Some had suggested that Kerry was too willing to complete the deal, to the point where he gave away too many concessions. Trump took advantage of those concerns during the election, and again called the deal weak Tuesday, without mentioning Kerry by name. But whatever you say about Kerry now, his commitment and determination to cut a deal were clear: He was the only negotiator who stayed in Vienna throughout the 18-day flurry of negotiations. Following surgery on a broken femur — which he got falling down while preparing for a bike ride in the French Alps — he was undergoing physical therapy in his hotel room between negotiating sessions and using crutches to get before global microphones. On the way back to the United States, triumphant negotiators huddled on their plane. Moniz broke out a bottle of fine Madeira wine, which had been given to him during a jaunt to Portugal to receive an award in the middle of the talks. It seemed a fitting drink for a historic moment: Madeira is what the Founding Fathers drank after signing the Declaration of Independence. Those same officials may break out something stiffer now, and they’ll be drinking for a different reason.